Another Day, another quilt. Well, not really. 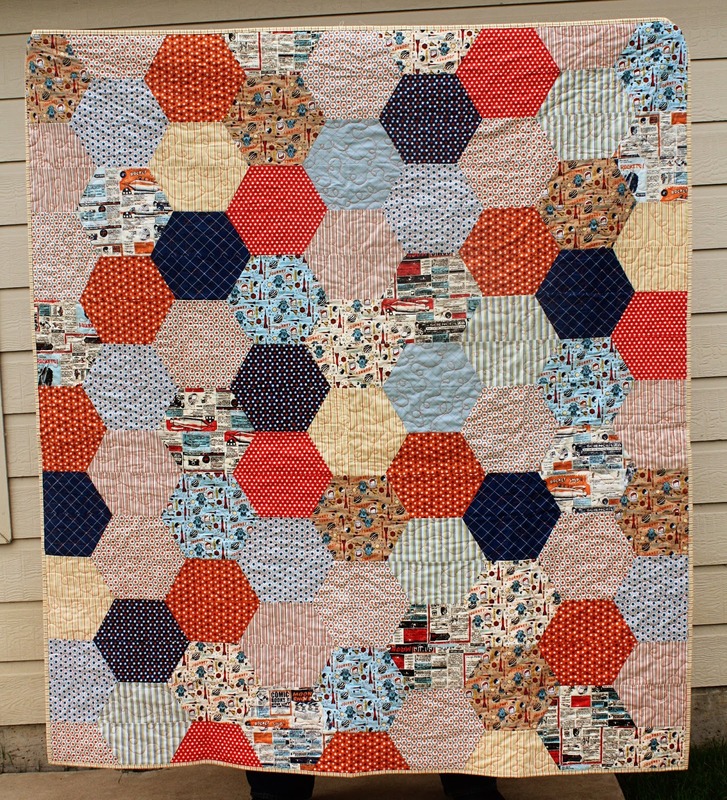 I actually finished this fun quilt a few weeks ago, but I just barely got a chance to take pictures of it. Like most of my project, I've had this fabric for years and have just now gotten around to turning it into something. Something about moving always motivates me to finish my works in progress projects. Thankfully the only piece that I needed to buy to finish it was the backing. This line was made in cotton and flannel. Generally, I only stick to cotton backings, but I splurged for some cozy flannel. I didn't use a pattern for this quilt. I just cut as many hexagons as I could from the fabric that I bought. I still have lots more hexagons left - which will someday by turning into another quilt. 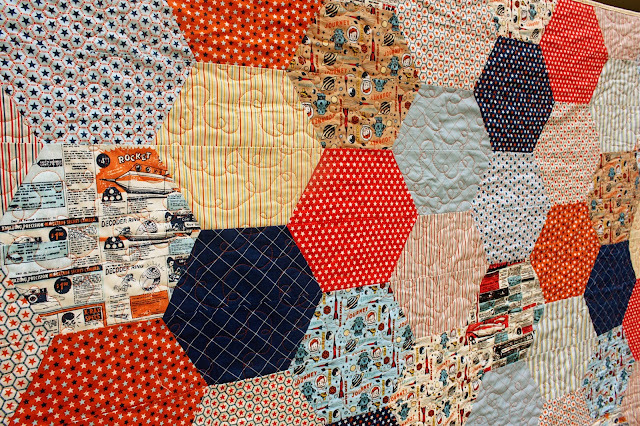 To make sewing the hexagons easier, I used half hexagons. 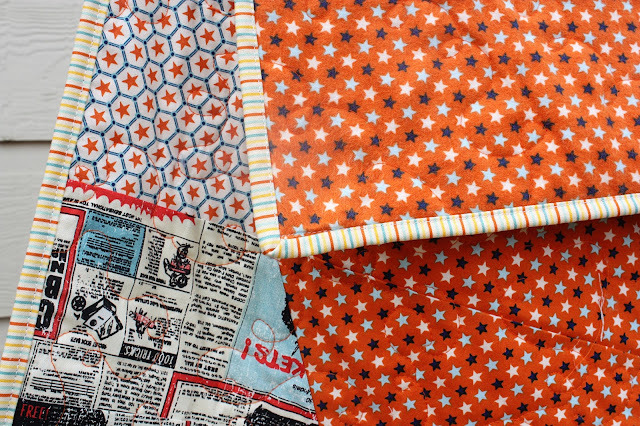 I used my Hex N' More Ruler by Jaybird Quilts. Worth every penny. It fits perfectly on 1/8 yard cuts. I quilted in an all over swirl pattern with orange thread. I wanted it to blend into the orange flannel backing. 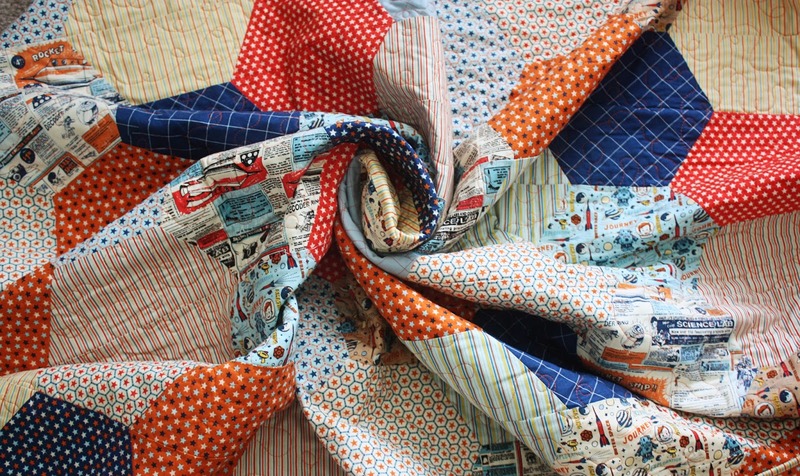 I ventured away from a lot of my standards on this quilt, but it sure is fun to look at. I love stripe bindings. If you look at most of my quilts, I try to use some kind of striped binding. Stripes are my favorite pattern (just look at my closet) and they always seem to make the best bindings. It's a pretty good size quilt. I haven't measured it yet but it's probably 70 x 80ish. It doesn't have a home yet, but it's awaiting a purpose, beautifully rolled up until I find one for it.